Sean Sherk has been off for the last two years, but that doesn’t mean the 39-year old former champion is hanging up the gloves. Today, Sherk reveals his plan to come back to fighting and also why he’s been away for so long. 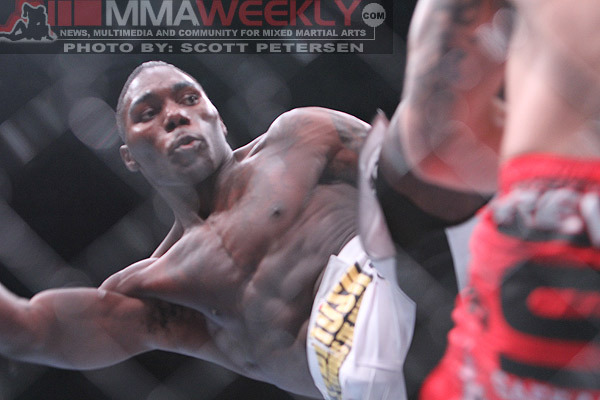 Also on the show today, Anthony Johnson talks about his upcoming co-main event fight against D.J. Linderman at World Series of Fighting, and how the whole 205lb division should be watching out now. Finally, TUF 16 fighter Sam Alvey joins the show and talks about the horrendous judging call on Friday’s episode, and how judging is ruining this season of the reality show. – Rate your interest level in a potential fight between Josh Koscheck and Nick Diaz on a scale of 1-10? – Can Sean Sherk be a top ten lightweight again when he returns? – Following Hector Lombard situation, should Bellator do anything and everything to re-sign Eddie Alvarez or is letting him go the smarter move? – Has judging ruined this season of the Ultimate Fighter?